Hi there- Bette Hardwick here from sometime in the 1920s with part three of my four-part series on the remarkable Eleanor Roosevelt, wife of New York Governor Franklin D. Roosevelt. There was a lot to tell, so I’ve divided my notes up into four parts: Childhood, School, Early Marriage, and Political Activism. You will remember that Eleanor had a transformative experience at school in England, where she was taken under the wing of the headmistress and inspired to work for social change. The summer she came home from school, Eleanor encountered her father’s fifth cousin, Franklin Delano Roosevelt, on a train trip. He was a student at Harvard. This chance meeting reintroduced the cousins and piqued their interest in one another. After a year of chance meetings, clandestine correspondence, and secret courtship, the two Roosevelts became engaged on November 22, 1903. Fearing that they were too young and unprepared for marriage, and believing that her son needed a better, more prominent wife, Franklin’s mother, Sara Delano Roosevelt, planned to separate the couple and demanded that they keep their relationship secret for a year. Sara Roosevelt’s plans did not work, and after a sixteen-month engagement, Eleanor Roosevelt married Franklin Roosevelt on March 17, 1905. President Theodore Roosevelt, who was in town for the St. Patrick’s Day parade, gave the bride, his niece, away. The wedding made the front page of the New York Times. Eleanor and Franklin were married on March 17, 1905. Although Eleanor loved Franklin, married life was difficult from the start. Eleanor’s mother-in-law, Sara Roosevelt, chose their first home, hired the staff, chose all the interior decorations, and became Eleanor’s most constant companion. Within a year, a daughter (Anna) was born; followed in rapid succession by James (1906), Franklin (1909, who died soon after birth), Elliott (1910), Franklin (1914), and John (1916). As the Roosevelt family grew, in 1908 Sara Roosevelt gave the couple a townhouse in New York City, which was not only adjacent to her own home but which had connecting doors on every floor installed. While the two women were very close; their intimacy only reinforced Eleanor’s sense of dependence and inadequacy. Eleanor was miserable. In September 1918, Eleanor was unpacking one of Franklin’s suitcases when she discovered a bundle of love letters to him from her social secretary, Lucy Mercer. He had been contemplating leaving Eleanor for Lucy. Turning down Eleanor’s offer of divorce, Franklin promised that he would end his relationship with Mercer. A divorce would ruin Franklin’s burgeoning political career. Following pressure from his political advisor, Louis Howe, and from his mother, who threatened to disinherit Franklin if he followed through with a divorce, the couple remained married. Their union from that point on was more of a political partnership. Disillusioned, Eleanor again became active in public life, and focused increasingly on her social work rather than her role as a wife, as she had for the previous decade. 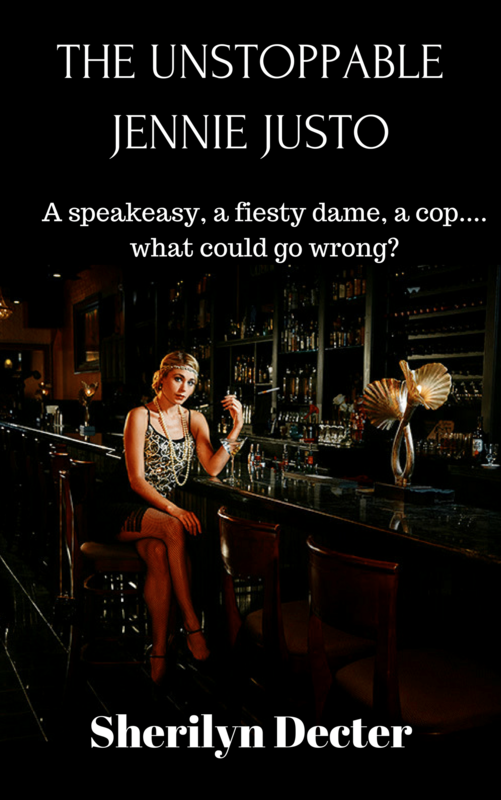 If you’re a fan of the 1920s and want a bit of escapism, consider signing up for The Unstoppable Jennie Justo. This is a great fictional story based on true facts and will give you a taste of Sherilyn’s books that I know we’re all waiting to read once they’re published. I didn’t know Eleanor’s family life had been so sad and bleak. What interesting articles you have here! This is great. Thanks, Shirley. ER is a hero of mine. Her story is so compelling. A powerful woman.